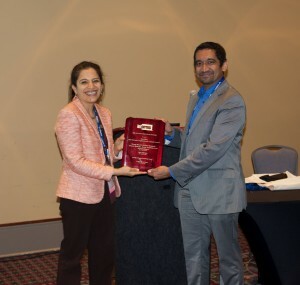 Researchers from the Mayo Clinic Robert D. and Patricia E. Kern Center for the Science of Health Care Delivery Health Care Systems Engineering Program and the Department of Orthopedic Surgery were presented the INFORMS Innovative Applications in Analytics Award Nov. 2, 2015, during the INFORMS Annual Meeting in Philadelphia. Their research was chosen through a multi-level review and selection process spanning over several submissions from a wide range of industries. Mayo Clinic’s project was chosen over other finalists American Airlines and MIT Operations Research Center/Rue La La (an online retail company). 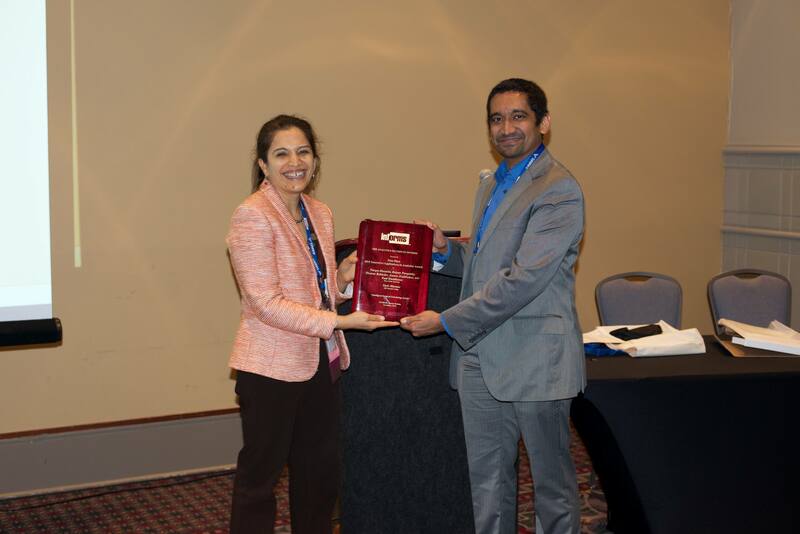 Pooja Dewan, Chair of the Innovative Applications in Analytics Award (IAAA) committee presents award to Mayo Clinic’s Kal Pasupathy, Ph.D. The project highlighted for this award presented to Mayo’s team is ‘Intelligent Surgical Scheduling.’ It showcased descriptive analytics to identify factors from surgical notes, predictive & prescriptive analytics to reduce delays for patients while ensuring increased flexibility to providers and improved utilization of operating rooms. Project co-authors included: Kalyan Pasupathy, Ph.D.; Jeanne Huddleston, M.D. ; and Paul Huddleston, M.D. ; of Mayo Clinic; as well as former Mayo Clinic colleagues Narges Hosseini, Ph.D.; Thomas Rohleder, Ph.D.; Yariv Marmor, Ph.D. The center’s HSE team is now working with urology, and colon and rectal surgery. Read INFORMS news article for full story.